Blogger's note: If you are interested in taking tyrosine as a supplement for ADHD or related disorders, the above diagram is a summary of the key nutrients which interact or play a role in tyrosine metabolism. In this blogger's opinion, we want to avoid deficiencies (or, in some cases, excesses) of any of these nutrients. If you are in a rush and do not want to read this whole posting, this table may be a good starting point. I have listed a number of links at the bottom to other sites as far as recommended daily intakes are concerned for the majority of these nutrients. This list is by no means extensive, but this will hopefully highlight the major impact factors in maximizing the benefits of tyrosine supplementation as an ADHD treatment strategy. (If the above diagram is not easily visible, most browsers will allow you to left-click the image to get a blow-up version, or you should be able to right-click the image with your mouse and view the image in a new window). We have spent the past seven postings on the pathway of tyrosine metabolism and the implications of supplementing with this amino acid nutrient (and its derivatives for ADHD). But does it actually work? Here's a brief review of the evidence for (and against) tyrosine supplementation. Much has been covered in the previous 7 blog posts, but some is new. Links to the studies (or summaries of the studies if the full article is not available) are provided in most cases. Tyrosine is a precursor to common neurotransmitters believed to be involved in ADHD (neurotransmitters are chemicals involved in various signaling or messaging processes in the nervous system) dopamine, norepinephrine and epinephrine (adrenaline). Imbalances (typically shortages) in the regions or "gaps" between neuronal cells of these chemicals often occur in ADHD and related disorders, so the idea with tyrosine is that it can theoretically boost levels of these deficiencies and potentially help correct this imbalance. Tyrosine can readily cross the blood brain barrier. This barrier has been discussed extensively elsewhere, but, in summary, the blood brain barrier is responsible for the passage of nutrients and metabolic products in and out of the brain (and also helps keep harmful agents out of the brain). L-DOPA, a derivative of tyrosine, and the first major product of tyrosine metabolism in most cases, is also able to make it across the blood brain barrier. Most of the major products beyond this point cannot, making tyrosine (or L-DOPA) potential supplementation agents which can be taken orally. As a "natural" and common amino acid, tyrosine is something the body already is accustomed to metabolizing through the diet. Note that tyrosine shares several enzymes and transporters with other amino acids and nutrients. Numerous anecdotal reports have found tyrosine to be useful for comorbid (co-existing) disorders to ADHD, such as depression. Given the high frequency of comorbid disorders associated with ADHD, tyrosine's versatility may potentially give us some "2-for-1" deals with regards to helping treat multiple symptoms or disorders at once. Tyrosine is a good starting point for nutrient-based treatments in metabolic disorders involving the amino acid phenylalanine (such as phenylketonuria). Phenylalaline is converted to tyrosine in a fashion similar to how tyrosine is converted to L-DOPa, via an enzyme-based chemical modification called hydroxylation (in which an "OH" chemical group is added to the molecule). Numerous anecdotal reports involving tyrosine supplementation for ADHD symptoms have indicated positive results (at least initially, we will see, however, that many of these benefits are often short-lived). Tyrosine may be used in conjunction with medications for ADHD and other related disorders. In other words, it may boost their effects (although this may be a double-edged sword, as some of these drugs are potent, so co-supplementation with tyrosine can possibly increase their side-effects and risks by several orders of magnitude in some cases). In this blogger's opinion, this may be the strongest potential use of tyrosine (as opposed to supplementation on it's own, which may often be short-lived). I personally believe that we often grossly underestimate the effects of supplements on medications, tyrosine's effects on stimulants (and other drugs targeting various types of dopamine-related pathways) are no exception. Tyrosine supplements are typically easily metabolized and cleared from the body, lessening potential side effects from residual metabolites (which is the case for several drugs). The enzymes responsible for tyrosine metabolism are often dependent on vitamin and mineral nutrients, and can be much more effective if adequate levels of these nutrients are supplied. 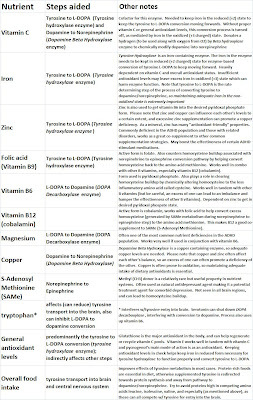 I have provided a table of some of these key nutrients in a table at the bottom (and top) of this posting. Beneficial responses of tyrosine for ADHD treatment are often short lived (and usually disappear within 2 to 4 weeks, as the body appears to "adapt" or tolerate the higher levels of tyrosine supplementation. In most cases, the imbalances of dopamine and norepinephrine are believed to be due as much to the transporters (or agents which shuttle these chemical in and out of the neuronal cells) or receptors (places on the cells where the dopamine or norepinephrine bind). Most ADHD medications (including the stimulants) typically work by blocking, modifying or reversing the modes of action of these transporters in an attempt to restore a proper "inside" vs. "outside" chemical balance. Interestingly, genetics appears to play a role as to the extent of how a certain transporter or receptor functions, and genes may even affect dosage requirements for certain ADHD medications (such as Adderall, or Strattera). In other words, blasting the body with high levels of tyrosine in hopes of using it as a precursor does not necessarily remediate these transporter issues. Localization is a problem. Imbalances of dopamine and norepinephrine in ADHD are often seen only in a handful of specific brain regions, so flooding the whole system with tyrosine may not be conducive to zeroing in on these target brain regions. Interestingly, however, the synthesis of monoamine neurotransmitters such as dopamine and norepinephrine may not be tied down entirely to specific brain regions, as there may be some flexibility as to where these chemicals are generated based on the demands (and failures) of other parts of the brain and central nervous system. While side effects may potentially be lower, tyrosine (or L-DOPA) does have some metabolites which can be harmful at high levels. The pro-inflammatory agent homocysteine is one such example, and has been discussed at length in a previous tyrosine for ADHD blog post. While anecdotal reports on the benefits of tyrosine supplementation for ADHD treatment abound, the actual number of published studies showing positive results for tyrosine (especially in the last 10-20 years) is surprisingly low. As mentioned earlier, tyrosine can "compete" with other amino acids such as tryptophan, valine, leucine and isoleucine for entry into the brain, because they share a similar system of transporters. In fact, there are a number of parallels between the tyrosine to dopamine/norepinephrine pathway and the tryptophan to serotonin pathway, in that they share similar enzymatic processes. In other words, it is possible to create imbalances or reduce the effectiveness of one amino acid (and its desired products of metabolism) if the presence of a competing amino acid is too high. This interference is often seen especially in the tyrosine/tryptophan and can potentially promote imbalances in the serotonin to dopamine ratios. Genetic disorders (which are relatively uncommon) or nutrient deficiencies can hamper the efficiency of several enzymes required for tyrosine metabolism. Even being short in one nutrient can cause problems. Given the nutritional status of many with ADHD, this may be a grave problem. As a result, there are numerous opportunities for the tyrosine supplement to be compromised. As a blogger on the subject, I always try to remain neutral (many times, however, this can be extremely difficult). When researching the stories and studies on tyrosine supplementation for ADHD, the one thing that continuously caught my attention was the degree of discord between the studies on tyrosine supplementation for ADHD (most of which showed no significant improvement) and the number of clinicians who prescribed it (and individuals who reported benefits from tyrosine). Again, this disagreement may be due to a number of things (differences between study conditions and the treated individuals, co-treatment with ADHD medications, the placebo effect, immediate vs. long-term effects, etc. ), so we need to be very careful when making a comparison. Having said all of this, and weighing everything I've read and researched, I admit (as a blogger) to being skeptical about the overall effectiveness of the whole tyrosine supplementation thing for ADHD. There just don't seem to be enough positive studies grounded in long-term improvements which tyrosine. Nevertheless, the number of positive reports on tyrosine from individuals are too great to ignore in most cases, so an outright condemnation of tyrosine for ADHD is by no means warranted. It is important to note that none of the studies I've seen (both those supporting or refuting the idea of tyrosine for ADHD) have paid much attention into controlling for the co-factors of the enzymes responsible for metabolizing tyrosine. Just as a reminder, co-factors are essentially vitamins, minerals and other nutrients which are used to help enzymes function properly (or at least more efficiently). There are (surprisingly) few well-controlled clinical studies which show tyrosine to be an effective long-term strategy for treating ADHD. In spite of this, tyrosine supplements are often prescribed by a number of physicians (seemingly in a disproportionate manner when compared to other agents with more promising clinical studies). This disparity is at least noteworthy. For those (few) studies who do tout the benefits of tyrosine supplements for ADHD, the symptom improvements are often short-lived (often only a few short weeks). However, this blogger personally believes that many of the studies may have shown minimal effects due (at least in part) to the fact that many of the other nutritional "puzzle pieces" (such as those given in the tables above) were either neglected or not necessarily in place. These vitamin and mineral-based cofactors can play a huge role in the metabolic conversion of tyrosine to its desired products, and has been discussed at length in the seven previous blog posts on tyrosine and ADHD. Had these studies incorporated some of these co-treatment strategies, some of the results might possibly have been different. Please note that while "natural", tyrosine supplementation is not always benign. Health risks, such as amino acid imbalances (due to the competitive nature of several amino acids with tyrosine to get into the brain), cardiovascular issues and even some types of cancers (which are often more associated with a derivative of tyrosine, L-DOPA, however) are very real. Additionally, biochemical side effects of tyrosine metabolism also exist, and can be magnified greatly if rampant tyrosine supplementation is undertaken. The pro-inflammatory agent homocysteine is one such example. However, nutrient-based treatments via B vitamins can often offset a potential homocysteine buildup. The dosages for tyrosine supplementation can vary widely ranging from as low as 100 milligrams all the way up to 5000 milligrams (or more, toxicity often begins to set in around 10,000 mg, but this of course widely varies by individual). 2-3 supplements of 500-1000 mg/day is typical in a number of cases (lower doses are almost always a must for children), but dosing should always be under the guidance of a physician. Most of the tyrosine supplemental strategies hinge or ride on the theory that ADHD is a dopamine or norepinephrine deficiency issue. However, much of the evidence on the disorder seems to indicate that the transport of these chemical neurotransmitters across neuronal cell membranes and an imbalance of the "inside-the-cell" vs. "outside-the-cell-in-the-gaps-between-neuronal-cell" concentrations of these agents is the real culprit. In other words, flooding the body with tyrosine in hopes that it will generate more dopamine and norepinephrine will not necessarily address this basis of imbalance. This blogger personally believes that tyrosine supplementation may be of much greater benefit if used in conjunction with a medication (often a stimulant or other dopamine "releasing" agent). Please note that these supplement-drug interactions may be extremely potent, so please only do this under the supervision of a physician. In other words, tyrosine supplementation for ADHD treatments is theoretically viable, and has had numerous success stories. Maintaining adequate intake of the nutrient cofactors listed in the tables above helps supply the body's enzymes with the tools they need to metabolize tyrosine most effectively. When dietary intake of these nutrients is sufficient, and tyrosine is wisely used in conjunction with proper pharmaceutical agents, this blogger personally believes that there may be great tangible benefits with regards to ADHD symptoms and treatment. As we can see, there are a number of enzymes, processes and intermediate steps involved in just this one pathway of tyrosine. Please note that other nutrients, such as ascorbic acid (a.k.a. vitamin C, which has a number of connections to ADHD) and S-Adenosyl methionine (also known as SAM or SAMe, which has also been discussed in greater detail in relation to ADHD elsewhere) are required in this process. Also, a number of enzymes are required to make this process go. Keep in mind that this list is not extensive. However, the vitamins and minerals are some of the key players in the conversion processes of tyrosine metabolism. This is extremely important. A lot of times we get lulled into believing that just because we're using a natural or dietary-based treatment strategy instead of potentially harmful medications, we are immune to negative and/or dangerous side effects typically associated with drugs. However, as a blogger, I urge everyone to reject this idea as quickly as possible. While the side effects as a whole may be a bit more benign or have more room for error for nutrient-based ADHD treatments, going overboard can be just as harmful. Minerals such as iron, copper and chromium all can be extremely toxic at high levels, and overdosing on certain vitamins (especially the fat soluble ones such as vitamins A and E, which are more difficult to flush out of the system than the water soluble ones), can also be harmful (or even fatal). Even the water-soluble B vitamins can cause problems if overdone (there is a high degree of interaction among most of these, and there is a relatively delicate balance between their levels. Over-supplementing on one, therefore, can greatly compromise the others). Amino acid supplementation can also be tricky. We mentioned in an earlier posting that chemically similar amino acids often "compete" with each other in areas such as entry into the brain and competition for the same enzymes. As a result, if we go overboard with supplementing on one type of amino acid (such as tyrosine, in the case of ADHD treatment), we need to examine some of the possible repercussions of disturbing the balance of the other amino acids and the products of their metabolism. Here we see that tyrosine-derived norepinephrine can be converted to epinephrine (adrenaline) in a process which utilizes the enzyme (phenylethanolamine N-methyltransferasePNMT). Even without a chemistry background, we can still see the chemical transformation process above. A methyl (CH3) group was added to the Nitrogen (N) on the right side of the norepinephrine molecule to form norepinephrine. But where does this methyl group come from? As mentioned in the last post on ADHD and tyrosine, the compound S-Adenosyl Methionine or SAMe, is a very important nutrient in a number of biochemical processes, in that it is able to "donate" (give-up) a CH3 methyl group. This is a relatively rare property among nutrients, and we are just beginning to scratch the surface with regards to the role of this nutrient in treating neurological and psychological disorders such as depression, ADHD and the like. However, when SAMe does donate it's CH3 methyl group, as in the case above, we are left with homocysteine (please note that there are a few additional steps to go from SAMe to homocysteine, it is not a 1-step conversion process. For simplicity, however, we will not go into these in any further detail. Nevertheless, homocysteine is a major end product of SAMe-related CH3 donor reactions, such as the one given above). In other words, higher tyrosine (or L-DOPA) levels can make their way to this step of the metabolic process and begin to deplete SAMe levels and lead to high levels of homocysteine. High levels of homocysteine are known as hyperhomocysteinemia, is commonly seen in Parkinson's patients, who often take large amounts of L-DOPA (the second step of tyrosine metabolism in our first diagram in this blog post). Numerous studies have shown that long-term treatment with L-DOPA leads to elevated homocysteine levels in the blood of Parkinson's patients. Elevated homocysteine levels have been linked from everything from cancer to diabetes to autoimmune disorders to stroke (however, please note that these results are far from unanimous, there are a number of studies showing the contrary for each of the diseases listed. Furthermore, there is still some debate as to whether the high levels of homocysteine are a causal factor for these disorders or just another side effect or symptom of these disorders. Nevertheless, the near-ubiquitous presence of high homocysteine levels in so many diseases across the board should at least suggest that homocysteine-lowering efforts are of great potential benefit, at least in this blogger's opinion). With regards to ADHD, the actual role of homocysteine is, admittedly, much more murky. While the mechanisms and overall physiology of an ADHD brain vs. a Parkinson's brain show acute differences (In ADHD, chemical imbalances between the "inside" and "outside" regions of a neuron exist, which can be chemically modified via medications which target the proteins which shuttle this neuro-transmitting agents in and out of the cells. In Parkinson's, however, the imbalances are caused by cell death and neuronal degeneration, requiring overall higher levels of neurotransmitters like dopamine need to be supplied via chemical precursor agents like L-DOPA), the fact that the two disorders both share similar treatment methods should (in this blogger's opinion) at least sound a warning bell that some of the negative effects for one might also be prevalent in the other. Surprisingly, there are very few studies (at least to the best of this blogger's knowledge) on homocysteine levels in the ADHD population, so it is difficult to get a good read on the subject. Nevertheless, given some of the points made earlier on tyrosine or L-DOPA supplementation or treatment and homocysteine buildup, we should at least examine some of the ways to reduce high homocysteine levels. Fortunately (at least in most cases), homocysteine-lowering efforts often respond very well to vitamin and mineral based treatments via supplementation or food fortification. At the center of this are the some of the well-known B vitamins. While the above diagram may look extremely complicated and "busy", please try not to get distracted. 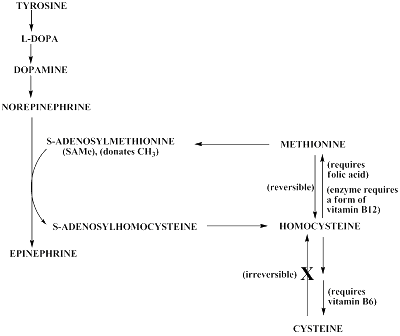 The first four "steps" at the top (the arrows simply refer to a metabolic pathway by showing the gradual transformation of one tyrosine-based compound to the next. We have discussed each of these steps in great detail in the previous postings) have already been covered extensively. The last step, the conversion of norepinephrine to epinephrine was discussed in the last posting on ADHD and tyrosine. The curved arrow simply refers to the fact that the norepinephrine to epinephrine conversion requires another nutrient-based compound SAMe. The norepinephrine essentially "steals" a methyl (CH3) group from SAMe, leaving SAMe to transform into another compound S-Adenosylhomocysteine (which then proceeds to our "dreaded" homocysteine). To put it another way, in order to make the norepinephrine to epinephrine conversion, the valuable nutrient SAMe must be "sacrificed" to a more potentially harmful compound homocysteine. If this SAMe to homocysteine conversion process is not kept in check, we run the potential risk of homocysteine buildup. However, based on the diagram above (look at the far right side of the diagram for this part), there are 2 different ways to "dump off" high levels of homocysteine by converting it to other more benign compounds. However, each of these two "paths" requires at least one type of B vitamin. This process requires a specific enzyme called cystathione beta-synthase (don't worry about remembering this enzyme, just remember that this enzyme requires a form of vitamin B6 as a cofactor or "helper to function). Thus, to optimize this vitamin B6-based conversion process, we want to make sure that we don't have any deficiencies of this vitamin. Please note that we already mentioned the need for vitamin B6 in another step of the tyrosine supplementation process for ADHD, the conversion of L-DOPA to dopamine. Thus, it is doubly important that we don't come up short on this vitamin. A rough summary of recommended dosage levels for B6 will be given at the end of this post (Blogger's note: not to go into too much detail here, but this homocysteine to cysteine conversion process is also dependent on another amino acid called serine. I have not included serine as an essential nutrient because serine deficiencies are rare. However, there are some genetic disorders in which serine synthesis is compromised. Seizures and related symptoms are common among those with this genetic defect on serine metabolism). The conversion of homocysteine to cysteine is (largely) irreversible. This is good news if we want to "dump off" homocysteine levels and not have to worry about the process chemically finding its way back to homocysteine (at least not through this pathway). Path #2: the conversion of homocysteine to the amino acid methionine: While path #1 is dependent on one type of B vitamin (B6), this pathway is dependent on 2 different B's: a form of vitamin B12 and a derivative of folic acid (vitamin B9). Without going into too much detail, this process requires a methyl (CH3) "donor" (which, in this case, is the modified form of folic acid here. This is very similar to like way the nutrient SAMe acts in helping the conversion from norepinephrine to epinephrine as mentioned earlier). Please note that, unlike the last case, this process is chemically reversible (which means that the process can go backwards and regenerate homocysteine to a certain extent). This process also requires a special enzyme called homocysteine methyltransferase. Again, don't worry too much about this enzyme, just note that it requires a form of vitamin B12 to function. To summarize: if we want to keep the "cycle" going to avoid homocysteine buildup by converting homocysteine to methionine, we need 2 different B vitamins: The folic acid as the chemical modifier, and vitamin B12 to help the enzyme involved in the process to function properly. Perhaps not surprisingly, taking B12 (also known as cobalamin) and a form of folic acid (folate) together has shown to be advantageous in a number of cases. Combinations of folate and cobalamin have also shown to be useful in reducing homocysteine levels in those treated with L-DOPA. Homocysteine can be an inflammatory compound that is produced indirectly as a result of tyrosine metabolism. High levels of this compound have been linked to a wide number of diseases and health risks. Vitamin B6 can be used to help "shunt" homocysteine to a common (and typically less-harmful) amino acid known as cysteine. This process is (essentially) irreversible. B6 is also a requirement for an earlier step of the tyrosine or L-DOPA metabolic process, the conversion of L-DOPA to dopamine. Vitamin B12 and folic acid can both assist in the conversion of homocysteine to another amino acid, methionine. Unlike the cysteine conversion process above, this process is reversible, meaning that it is possible to "work" backwards towards homocysteine in a bi-directional pathway. Because of the importance of these 3 B vitamin-derived factors in the prevention of homocysteine buildup, it is imperative that we try to avoid shortages of these agents at all costs (but be careful about over-supplementing, B vitamins work best in specific ratios, and overdosing on one can compromise the functions of the other, as we have noted in previous posts on ADHD and nutrient deficiencies). Here are some good sites which list the suggested daily amounts for folic acid (folate), vitamin B6 and vitamin B12. Going slightly higher is often fine (as these agents have relatively high "ceilings" between recommended amounts and toxicity levels), but try to keep the ratio of these different B vitamins as close to the same as in the recommended amounts as possible. Again, please make sure your physician is in the know if you choose to supplement with anything significantly above the recommened levels. This is our second-to-last post on ADHD and tyrosine. The last one on tyrosine supplementation strategies for ADHD will give a recap of all the key enzymes, nutrients, and chemical intermediates we've covered throughout the past seven postings. It will also provide a summary of what the main studies on exactly how effective tyrosine supplements really are based on clinical studies. Finally, we will briefly mention how tyrosine may be able to augment the effects of common ADHD stimulant medications. The amino acid tyrosine is often prescribed as an alternative strategy for treating ADHD, either alone (and often in the place of ADHD stimulant medications), or in combo with one or more medications for the disorder. But how effective is tyrosine really? Is it a valid ADHD treatment method, or just another theoretical supplement strategy that has only minimal positive effects on the disorder? In the past four posts, we have examined the following metabolic pathway of tyrosine in the conversion process of this amino acid to the neuro-signaling chemicals dopamine, norepinephrine, and epinephrine (adrenaline) and the implications for this on the biochemical factors involved in the onset and treatment of attention deficit hyperactivity disorder. In part 1 of our series on ADHD and tyrosine supplementation, we did a quick overview of the above process, the connection between regional levels of these compounds listed above with regards to the neuro-chemistry of ADHD, and gave a general theoretical basis for tyrosine supplementation (based on its metabolic profile and some of tyrosine's biochemical products and pathways in the body). We also introduced the concept of the blood brain barrier, which is a biochemical barrier that controls the flow of chemical agents into and out of the brain. This blood brain barrier has numerous implications for drug design and therapeutics, and must be dealt with if we are to get the desired compounds, drugs and nutrients into the brain. In part 2 of the tyrosine and ADHD discussion, we looked at the enzyme Tyrosine Hydroxylase, and the dietary nutrients which were involved in making this enzyme run effectively. Some of the nutrient-based strategy were based on clinical trials, while others were more based on theory. Part 3 of the ADHD/tyrosine blog series centered around the merits of starting with tyrosine as a supplementation strategy vs. bypassing tyrosine and starting with the second compound in the above pathway, L-DOPA (also called Levodopa). L-DOPA is commonly used as a treatment agent in Parkinson's Disease (which has a moderate degree of overlap with ADHD as far as chemical happenings are concerned), but we investigated the pro's and cons of starting with this agent vs. starting with its precursor tyrosine for treating ADHD. and finally, Part 4 of the tyrosine postings zeroed in on the second major enzymatic step of the pathway, in which L-DOPA was converted to dopamine. This process is heavily dependent on a class of enzymes called aromatic amino acid decarboxylases, with the main enzyme of focus being a specific type called DOPA decarboxylase. In order for these enzymes to function, however, we discussed their dependence on a compound called pyridoxal phosphate (pyridoxal phosphate is an "active" form of Vitamin B6). We also looked at how competing amino acids and their products (namely the amino acid tryptophan and its product serotonin), actually share these enzyme systems and can interfere with the L-DOPA to dopamine conversion process and sabotage the effectiveness of the tyrosine-driven ADHD treatment strategy. *Blogger's note: What follows is a lengthy explanation of why dopamine and norepinephrine are so important for ADHD, and how they interact with specific proteins called "transporters" or "receptors" to regulate their overall levels in key "ADHD" brain regions. If you are short on time, you may want to bypass this long explanatory section which starts and ends with a triple asterisk (***). It is important to note, first of all, that this dopamine to norepinephrine conversion is not universal throughout all of the body, or even throughout the whole central nervous system. In many regions of the brain and nervous system, the chemical conversion process and metabolism of tyrosine "stops" at dopamine. However, in other key regions, the necessary enzymes exist to continue on with this conversion process to norepinephrine (and even beyond in some cases). We have hinted elsewhere that both dopamine and norepinephrine (namely imbalances of these two neuro-signaling agents) play a major role in the pathology of ADHD and its symptoms in most cases. However, it is important to note one very important thing here: many of the studies implicating dopamine and norepinephrine in the pathology of ADHD are often concerned more with the transport process of these two signaling agents into and out of neuronal cells, and are often less concerned with the overall concentrations of these two chemicals in the body or even the central nervous system. Of course there is some degree of overlap (a vast overall deficiency of dopamine or its precursors, for example, would probably put one at more risk of having a deficit of this chemical in the key target areas of the brain), but we must get past the thinking that incorrectly assumes that if we just boost overall levels of these compounds across the board, then these chemical imbalances will just work themselves out. This is simply not the case, and unfortunately, in this blogger's opinion, many advocates of supplementation instead of medications often fail to address this all-important issue of the transport process. Among the many different ways of transporting dopamine and norepinephrine in and out of the neuronal cells, we must look at two key players: the receptors and the transporters. The receptors (in a nutshell), are located on the outside of a cell (in this case, the neuronal cells in the brain), and are the place where signaling agents such as dopamine, norepinephrine, histamine, etc. essentially "dock" onto the cell. Proper functioning of these receptors is especially important with regards to disorders such as ADHD. We have even looked at some of the specific genes which code for these receptors, and have analyzed how certain genetic forms of these "receptor genes" are often associated with a higher likelihood of having ADHD. For example, some of the earliest posts on this blog looked at specific genes that coded for dopamine receptors, such as the Dopamine D4 receptor gene (DRD4) and the Dopamine D5 receptor gene (DRD5) . The DRD4 gene is believed to be one of the most "heavily" influencing genes out there with regards to ADHD genes, while the DRD5 gene, while showing a somewhat weaker genetic connection to ADHD overall, seems to show a bit more of a specific connection to the inattentive component of ADHD (as opposed to the hyperactive/impulsive component of the disorder). With regards to genetics and chemical receptors for the neuro-chemical norepinephrine, it appears that there are also some genes which may affect this norepinephrine-receptor relationship. There is some evidence for a specific gene called ADRA1A. ADRA1A is a gene located on the 8th human chromosome, and is believed to code for a specific receptor of norepinephrine. In fact, there are some implications that having a particular form of this ADRA1A gene may even influence the effectiveness of medications such as clonidine (which is a drug often used to treat hypertension, but is sometimes used "off-label" as an ADHD treatment medication. Clonidine has a different mode of action than the typical stimulants, but has found some success as a second or third level treatment method for certain types of ADHD). It is important to note that several of the most common ADHD medications target (either directly or indirectly) these transporters, which influences the overall balance of dopamine and norepinephrine in and out of cells. In other words, if we want to truly replace drugs with nutrition for treating ADHD, we need to overcome this receptor problem (at least in theory). This is why (in the blogger's opinion) nutrition-based treatments often come up short, because while they may be able to influence production and overall levels of neuro-signaling agents such as dopamine and norepinephrine they are often nowhere near as chemically "potent" at modifying the transporter issues. If you're interested, an earlier post talked about some of the specific genes, receptors and transporters, and how some of these "ADHD genes" may even play a specific role on how we should dose ADHD medications. Switching gears away from dopamine and norepinephrine receptors, we must also examine another important class of proteins which regulate dopamine and norepinephrine levels both inside and outside of neuronal cells. These are called "transporters". As their name suggests, these agents essentially go one step further in the process by shuttling neuro-signaling chemicals such as dopamine and norepinephrine both into and out of cells. In other words, these dopamine and norepinephrine tranporters also play a vital role in the process. We can talk about these transporters all day (and we have, in other previous posts on this blog! ), but for sake of brevity, I should just mention that specific genes for dopamine transporters (called the dopamine transporter gene or DAT), and for norepinephrine transporters (called the norepinephrine transporter gene or NET, however, it is also referred to by another completely different name: SLC6A2) both have been studied extensively with regards to their genetic influences on ADHD and related disorders. As mentioned earlier, these transporters often play major roles in medication responses, and may even be linked to co-occurring disorders in ADHD, such as bulimia, drug addiction, anxiety disorders, etc. The nutrient ascorbic acid (aka vitamin C), especially with its regard to oxygen (O2), as depicted above. Dopamine Beta Hydroxylase enzyme: We have examined Dopamine Beta Hydroxylase (often abbreviated as DBH) several times in previous posts. The gene coding for the DBH enzyme (of which the gene shares the same name, "DBH") is located on the 9th human chromosome. This enzyme is responsible for adding a hydroxyl (-OH) group off of the dopamine molecule, which leaves us with the new neuro-chemical norepinephrine. Note that this is the second time in the overall conversion process of tyrosine to L-DOPA to dopamine to norepinephrine that an "OH" group was added, the first being the work of an "OH" onto the hexagon ring of tyrosine to convert it to L-DOPA (see first diagram in this blog post if this is confusing). Ascorbic Acid (vitamin C): We mentioned vitamin C in an earlier post, in that it can play a "helper" role in the conversion of tyrosine to L-DOPA, a process which utilizes the enzyme tyrosine hydroxylase. Tyrosine hydroxylase is dependent on iron, but the efficacy of the enzyme requires iron to operate in the "reduced" form as opposed to the "oxidized" form (the reduced form has iron in a "+2" positively charged state, and in the "oxidized" form, iron exists in the even more positively charged "+3" state. In nature how positively or negatively charged a certain element is can have drastic effects on its biological function. In the case of the tyrosine hydroxylase enzyme, and the metabolism of tyrosine, this is no exception). Much of this "helper" role of vitamin C was due to the ability of the vitamin to keep the iron in the desired "+2" state. Some studies have found this tyrosine hydroxylase enzyme to be significantly compromised in vitamin C deficient states (as in scurvy). However, while tyrosine hydroxylase the enzyme Dopamine Beta Hydroxylase appears to be even more heavily dependent on vitamin C, as mentioned in an earlier blog entry titled: 10 Ways Vitamin C Helps Treat ADHD Symptoms (this was mentioned in point #9). For the conversion process of tyrosine to L-DOPA, much of vitamin C's usage was due to its antioxidant status, but for this dopamine beta hydroxylase enzyme, which is used to convert dopamine to norepinephrine, vitamin C is used more of as a "co-factor" or "helper" to the enzyme. As mentioned above, vitamin C must be "sacrificed" to get the oxygen atom from the O2 molecule and onto the dopamine molecule to convert it to norepinephrine. The end result of this "sacrifice" is a different oxidized form of the vitamin, which is known as dehydroascorbate. This brings up another important point. We have seen in the past how vitamin C is often an "altruistic" agent in ADHD treatment, in that it frequently sacrifices itself for the well-being of other nutrients of importance to ADHD. For example, we've spoken at length about the problem of oxidation of omega-3 fatty acids (since omega-3 supplementation is a common ADHD supplementation strategy, this damaging oxidation process can be quite severe if not controlled for), and how vitamin C can help in preventing omega-3 oxidation in ADHD treatment cases. Vitamin C often helps "recycle" other antioxidants such as vitamin E (which is much more fat-soluble than vitamin C, so it is often recommended for antioxidant treatment strategies for ADHD that vitamins C and E are used in tandem). Please note, then, that since vitamin C is used in the dopamine to norepinephrine pathway, and that it is essentially "lost" in the process (unless it is returned to its native ascorbic acid form by another antioxidant, such as glutathione), it is crucial that we maintain adequate levels of vitamin C. Furthermore, since vitamin C is a water soluble vitamin, it gets removed from the system quite easily. Therefore, it is imperative that we maintain adequate pools of this vitamin through diet or supplementation. A rough estimate of daily vitamin C requirements can be found here. However, since toxicity is rarely an issue with vitamin C (see the upper limits of the vitamin here, and note how much of a ceiling there is between the recommended levels and the upper limit), going slightly higher (i.e. 2 times the recommended amount) is rarely a problem. Therefore, this blogger personally recommends that since the vitamin is useful in at least 2 different parts of the tyrosine to dopamine and norepinephrine conversion process (involving both the tyrosine hydroxylase enzyme for the conversion of tyrosine to L-DOPA and the dopamine beta hydroxylase enzyme-driven conversion of dopamine to norepinephrine), those wishing to try tyrosine supplementation for ADHD should maintain adequate (if not slightly higher than "adequate") levels of the vitamin. We will wrap up our discussion of tyrosine supplementation for treating ADHD in the next few blog posts. We will look briefly at the norepinephrine to epinephrine conversion process, but focus more on some of the potentially harmful side-products of tyrosine metabolism, including the potential buildup of the pro-inflammatory agent homocysteine. Finally, we will finish with a final post on the blogger's thoughts on the whole process, recap the different nutrients needed to optimize enzyme function for overall tyrosine metabolism, and look at possible ways in which, instead of being used completely in isolation, tyrosine supplementation could also be used as an adjunct or accessory treatment to common ADHD medications, possibly optimizing their function and improving their effectiveness in treating ADHD and related disorders.